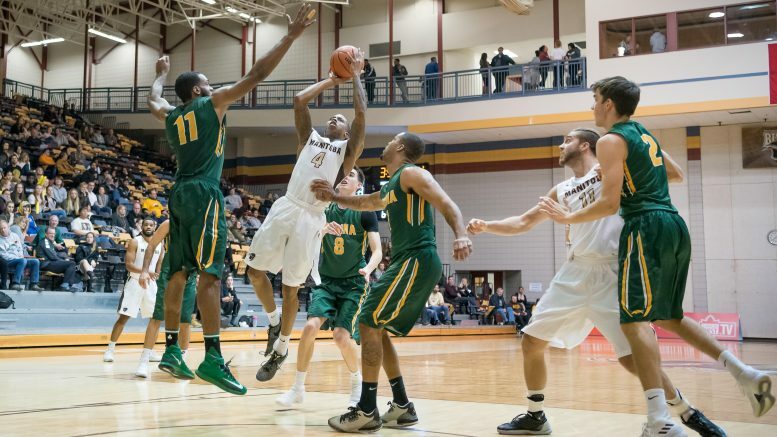 Bison Rashawn Browne drives to the basket against the University of Regina Cougars on Nov. 2. Manitoba won 83-74. This weekend the University of Manitoba basketball teams hosted the University of Regina Cougars at the Investors Group Athletic Centre. The men’s basketball team split the Cougars by winning Friday but falling just short on Saturday. The women remained winless against the powerhouse Cougars, but put up a good fight in Saturday’s loss. On Friday, the women fell 85-48 to the second-ranked Cougars, never establishing themselves in the game. The Cougars came out hard in the first quarter, scoring 23 points. An Emma Thompson three-pointer was the lone points Manitoba got in the first. Thompson finished the night with 15 points to lead the Bisons. Manitoba pushed to start the second half, scoring 20 points in the third quarter but it was far from enough to win this game. Charlotte Kot of the Cougars had a field day in the paint, scoring many uncontested layups. Kot finished with 16 points on the night. Saturday was a better day for the Bison women, the team putting up 21 more points than the night prior in a close 72-69 game. Nicole Konieczny led the way for Manitoba, finishing with 23 points and eight rebounds. Thompson was close behind, with 21 points and nine rebounds. Manitoba even managed to lead by four points in the third quarter, but the Cougars went on a 6-0 run to end the quarter and regain the lead. The Bisons are now 0-4 and sit in second last in the Canada West. Friday was a sluggish start for the men against the Cougars, but the team rallied in the second half to come away 83-74 victors. Justus Alleyn had a monster game for Manitoba, playing almost the entire game, scoring 25 points and six rebounds. Regina held a 44-37 lead at the half, but the Bisons went on a 10-0 run to start the third quarter to gain the lead. A torrential run largely due to the play from Alleyn. Saturday was a heartbreaker for the Bisons, falling 89-87. After the Bisons managed to tie the game at 87 late in the fourth, Cougar guard Alex Igual sunk a jumper to give the Cougars their first win of the season. Alleyn was once again the catalyst for the Bisons, scoring 24 points and three rebounds. James Wagner was not far behind, with 20 points and six rebounds. Four games into the season, both Wagner and Alleyn find themselves amongst some of the best in the Canada West. Alleyn is fourth in the Canada West in points per game, averaging 23.3 a game. Alleyn is also third in the Canada West in three-point percentage, sinking 63.6 per cent of his attempts, with Wagner in fifth with 60 per cent. Manitoba is now 3-1 on the year, and hold sole possession of fourth place in the Canada West. The Bison basketball teams will host the MacEwan University Griffins on Nov. 10-11 at the Investors Group Athletic Centre.